Details: A very fine and impressive portrait of an important London merchant. This portrait is of Sir John Buckworth (c1602-1687). It has an identifying cartouche at bottom left, with the date 1663. 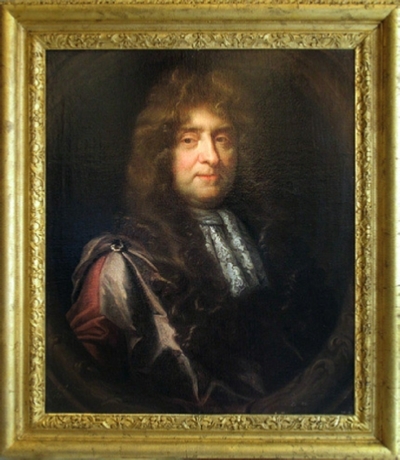 Sir John Buckworth was Deputy Governor of the Turkey Merchants (importers of fine Ottoman carpets) and held the office of Alderman of London between 1683 and 1686. John Riley (1646-1681) was considered to be one of the two best portraitists of his time. Born in London where his father was Lancaster Herald, he studied under Isaac Fuller and Gerald Soest and was influenced by Lely. He quickly built up a good practice with the middle classes and took over Lely’s mantle when the great portraitist died. He and Kneller were jointly sworn and admitted chief painter to King Charles II in 1688. Sadly, he died only three years later, otherwise he could well have eclipsed Kneller. Amongst his pupils and assistants were J.B.Caspars, Jonathan Richardson and Thomas Murray. It was attributed to Riley by Messrs Christie’s, but even the most unpractised eye can testify to its quality and similarity to other works by him.